What’s in a name? If you ask Facebook, it’s the text on a driver’s license or a formal document like a utility bill or library card. But for many Facebook users, it’s not that simple. From transgender people to domestic abuse survivors to journalists seeking to protect their privacy, Facebook’s requirement that users go by a name found on an ID – also known as the authentic name policy – leaves those users without a voice. Not only is this policy exclusionary and badly enforced, it also limits speech and places users in harm’s way. We highlighted these problems last year, but Facebook failed to act. That’s why we’re joining a global coalition today and demanding changes to this policy with a public letter and petition. 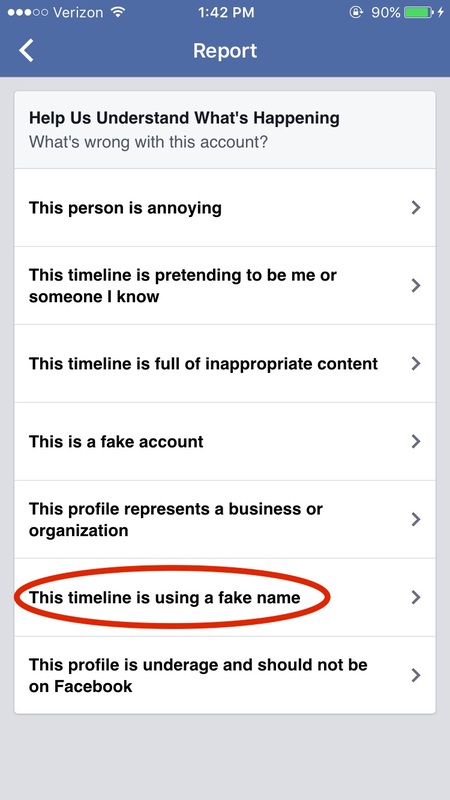 Facebook requires people to use names representing their authentic identities. That sounds simple, but it’s not. If you use Facebook, you are not required to submit an ID upon registering an account, but if another user reports you for using a fake name (whatever that means), then Facebook demands proof of identity. This is where things get difficult for many users who lack IDs or documentation featuring the name they’d prefer on the service. These users, stuck in Facebook’s “absurd pseudonym purgatory,” are left with a difficult choice: use a legal name or lose access to their friends, families, and support networks. So if Facebook doesn’t require a legal name to sign up, why is this an issue? Because, like most social media services, Facebook relies on its users to help enforce rules through reporting. This practice, combined with the name policy, allows people to report users for having fake names, shutting those users out of their accounts and providing a sort of “heckler’s veto” to those who want to silence everyone from Native Americans to Gaelic speakers and even members of the clergy for using their real world names. This wouldn’t be a big deal if services like Facebook weren’t such an important place for social and political speech today. But as Facebook likes to remind us, that’s what social networks are. Corporations like Facebook have an important responsibility to limit the censorship of speech on their services. So we find it alarming when people risk indefinite exclusion from Facebook simply for using a name not found on an ID. But again and again, Facebook users that publish unpopular speech have found themselves targeted under the names policy and effectively silenced on the service. Users can’t appeal these decisions, just like they can’t appeal the removal of content elsewhere on the site. The world was a very different place when Facebook was founded in 2004. Over a decade later, it is time for Facebook to evolve and recognize the diverse identities of its users. If Facebook plans on “connecting the whole world,” then it must stop excluding people simply for using their preferred names. Inclusion is not only a better business strategy, it’s good for free speech. That’s why we’re encouraging Facebook to welcome all users, regardless of name. Please join the ACLU and over 60 domestic and international organizations in urging Facebook to make meaningful changes to this flawed and outdated policy. Matt Cagle is a technology and civil liberties attorney with the ACLU of Northern California.